If you set up a reminder and you no longer require it to be sent out to one of the athletes being notified, simply remove the athlete from the list. The example here shows that the Data Entry Athlete need to stop being sent the daily reminder. 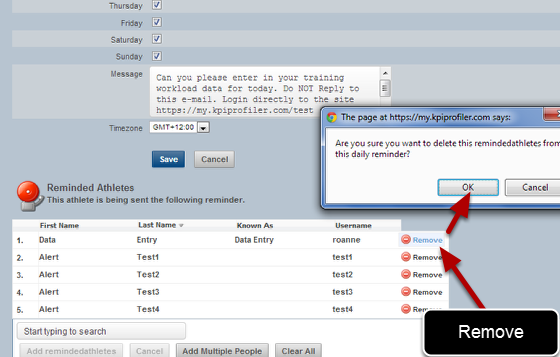 Simply remove the athlete from the reminders list by clicking on "Remove" and then clicking on "OK". Once removed from the list they will no longer receive the notifications. If you are in the off season and you do not require any athletes to be notified, click on "Clear All" to remove all of the athletes. If you no longer require that athletes are monitored for a specific period of time during the year, but you will use the reminder in the future you can just remove the athletes from the Reminder. You can remove all of the athletes from the Reminded Athletes or Reminded Groups List at once by clicking on "Clear All" and then confirming the removal. If no athletes are listed the alert will not be sent. -Open the Daily Reminders Module. -Click on the Delete button for the Reminder that is no longer required. -Confirm the delete and the reminder will be removed from the system.